Like many Pixar films, Ratatouille is about identity. A rat with a taste for fine food dreams of breaking out of his rat life to cook like the famous French chef Gusteau. 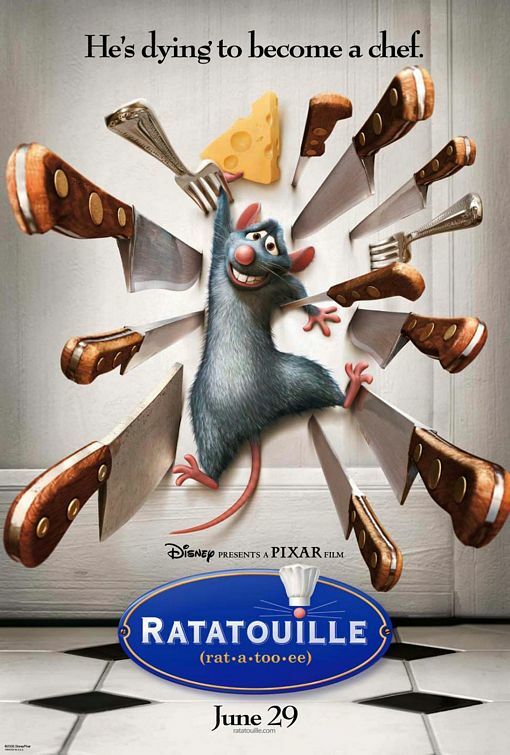 After his love for food leads to the rat clan evacuating their home, the rat Remy finds himself in Paris at the restaurant of the famous chef. Meanwhile, the clumsy Linguini flounders as the garbage boy and unwitting heir of Gusteau’s restaurant. I know this sounds insane. But well, the truth sounds insane sometimes, but that doesn’t mean it’s not. The truth. And the truth is I have no talent at all. But this Rat… he’s the one behind these recipes. He’s the cook. The real cook. Little Chef? He’s been hiding under my toque. He chooses the ingredients, the spices—he’s been controlling my actions. He’s the reason I can cook the food that’s exciting everyone, the reason Ego is outside that door. You’ve been giving me credit for his gift. I know it’s a hard thing to believe, but hey– you believed I could cook, right? Look. This works. It’s crazy, but it works. We can be the greatest restaurant in Paris. And this rat, this brilliant little Chef can lead us there. Whaddya say? You with me? For Christians, God controls our actions. He takes over. He’s the one behind these beautiful things like love, joy and goodness. He’s the reason I can do anything good. As Linguini credits Remy for the amazing cooking he produces, so we understand that the good works we do as believers are God working in and through us by the Spirit. Good works are something God does in us; not what we do to get to God. Linguini simply entrusts himself into Remy’s hands. genius now cooking at Gusteau’s, who is, in this critic’s opinion, nothing less than the finest Chef in France. I will be returning to Gusteau’s soon, hungry for more. In the end, Remy achieves his dreams of cuisine fame and Linguini happily serves as a waiter in the new small business venture in which Ego invests. The Gospel is not about personal success, but it is a story of humble origins to great victory. Jesus, born among humble surrounds of lowly animals, dies a criminal’s death though the governor Pontius Pilate could find no fault in him, and conquers death in a victorious resurrection. This death is on our behalf, and through faith in the promise that this death and resurrection forgives our sin, God begins to reign. In response we too can begin cooking up great things – not for ourselves but for others. Ego is one of my favorite characters in all of film (it helps that he’s voiced by Peter O’Toole). Great article!